Last December's Daring Baker's Challenge was to make a Buche de Noel, which seemed complicated at the time but was nowhere near the steps required for this French Yule Log. All the steps were fairly easy, just time consuming. And it took a lot of planning ahead of time to make sure everything required for each part was ready to go. Take the Praline Feuillete (Crisp) Insert layer. It only had four ingredients, but two were items we had to make - the praline paste and the lace gavottes. Praline paste necessitated the peeling and roasting of hazelnuts, which I had in the freezer, but this time around I found the best way on the internet which made life so much easier. Rose Levy Barenbaum describes a way to peel hazelnuts that involves boiling them in water and baking soda, what a life saver. My little sister Julianna is visiting from Christmas through New Year's Eve, so we devoted an entire day to the making of this French Yule Log. (There she is while I was working on taking photos.) She made the feuillette and the crisps and helped with everything else as well. It was definitely helpful to have an extra pair of hands! As I made this recipe I discovered I didn't have a loaf pan. I'm sure I used to, but either I threw it out or it is hiding with the springform pan that has also taken a vacation. I looked around and discovered the ice tub that comes with the fridge sitting on top of the fridge, and it was just about the right size, so I lined it with cardboard from the chocolate boxes, plastic wrap, and we went from there. We had slices of the French Yule log tonight after making pizzas (a la Daring Bakers Challenge October 2008) and the verdict was torn. The person that didn't do any of the work thought it was great, and loved all the different tastes and textures. Those of us who did the work would have made less components. I could have done without the chocolate creme brulee - it was icey in the slice and didn't have a lot of flavor (while excellent slightly chilled, it just takes the longest to unthaw). 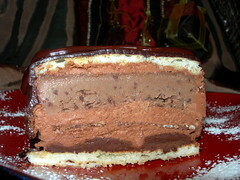 The dark chocolate mousse was amazing and was a nice companion to the ganache and feuillette. As 2008 comes to a close, I'll take this opportunity to extend best wishes to everyone for 2009. You never know what's in store! One set of my in-laws is here this week, and we had a birthday to celebrate today. I made gingerbread on request, and decided to offer various toppings for it. I have memories of applesauce with gingerbread growing up, whipped cream (specifically from a squirty can) seems essential, and I also see lemon curd offered with gingerbread on restaurant menus. So I did all three. The gingerbread recipe I used was a modification of Ina Garten's Old Fashioned Gingerbread, and if you are a fan of raisins I would go ahead and use mine. Nobody here was really a fan, plus I was out of rum and didn't want to go out to the stores on the day before Christmas Eve just for that. And fair warning - the only sweetness in this recipe is the orange juice and molasses, so this may not be sweet enough for some palates. Personally, after a season full of sugar, it was perfect for me. Here is my modified recipe! 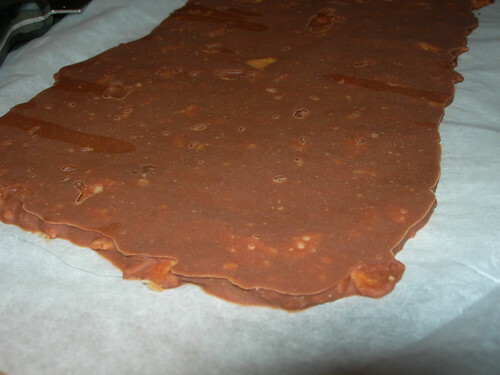 Preheat the oven to 350 degrees F. Grease an 8x8 inch cake pan and line with parchment paper. Grease and flour the pan. Place the butter and molasses in a small pan and bring to a boil over medium heat. Pour the mixture into the bowl of an electric mixer fitted with the paddle attachment. Cool for 5 minutes, then mix in the sour cream, orange zest, orange juice, and vanilla. Meanwhile, sift the flour, baking soda, ginger, cinnamon, cloves, and salt together in a small bowl. Mix with your hands until combined. With the mixer on low speed, slowly add the flour mixture to the molasses mixture and mix only until smooth. Add the crystallized ginger to the mixture with a spatula. Pour (or scoop, it will be thick) into the prepared pan and bake for about 35 minutes, or until a toothpick comes out clean. Set aside to cool completely. For my method, remove the cooled cake from the pan and cut into 25 or 36 squares. Dollop various ones with heated lemon curd, whipped cream, and applesauce. Happy holidays everyone, from JennyBakes! I have been wanting to make these cookies for several years and finally got my act together. 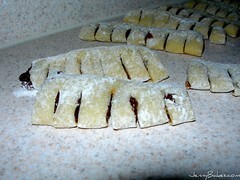 They are a little time consuming because the dough and filling have to be made ahead of time. I think the flavor is nice - the spices and sweetness are a good balance with the dough, but these are more adult cookies than for kids. 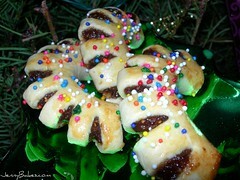 They remind me of the mincemeat-filled cookies my Grandma sometimes makes during the holidays. According to the cookbook, cucidati are the Sicilian version of buccellati, which means "little bracelets." 1. Pulse flour, sugar, baking powder, and salt together in food processor. With the machine on, add butter and shortening a few pieces at a time through feed tube and process until evenly combined and mixture resembles coarse meal. Pulse in eggs one at a time until mixture forms large, moist clumps. Scrape dough onto large piece of plastic wrap, cover completely with wrap, and refrigerate for 1 hour or overnight. 2. To make filling, combine figs, water, and sugar in a medium saucepan and bring to a boil over medium-high heat. Reduce heat to low, cover, and simmer until figs are fork tender, about 20 minutes. 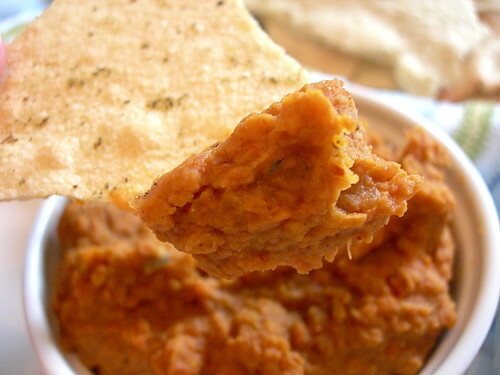 Transfer to food processor and process into a thick, smooth paste. Add almonds and process until nuts are finely chopped within the paste. Add remaining filling ingredients and pulse until combined. (Filling can be made up to 4 days ahead and refrigerated in airtight container). 3. Preheat oven to 350 degrees F. Line 2 cookie sheets with parchment paper. 4. Divide dough into 8 pieces. Shape each piece by rolling beneath your palm on a lightly floured surface into 1-inch-diameter rope; then roll rope out float with a rolling pin to a 1/4-inch thickness, about 3 inches wide and 20 inches long. Spread filling down center, making a 1-inch-wide x 1/2 inch-thick strip of filling. Fold both sides over the filling and pinch firmly to close. Use hands to squeeze the cylinder gently and roll back and forth to coax into a round shape; have seam side down. 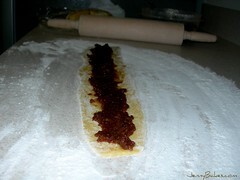 Make slashes at 1/4-inch intervals all along the pastry, then cut into 3-inch lengths. Place 1 inch apart on cookie sheets and bend into a crescent shape. Repeat with remaining dough and filling. 5. To make topping, whisk egg until frothy. Brush egg on cookies and sprinkle with coarse sugar, sprinkles, or nonpareils. Bake until light golden brown around edges and on bottom, about 20 minutes. Slide parchment onto racks to cool completely. The only change I made to this recipe was to use orange juice instead of water, because I didn't have candied orange peel but still wanted an orange flavor element. It seemed to work fine. I'm not sure these cookies will prove good enough to warrant going into the JennyBakes Family Annual Tradition for holiday baked goods, but I'm still glad I made them! I just got back from a cruise, which was a nice way to spend what would otherwise be a very cold week in December. We decided to drive to Miami instead of fly since we had not seen much of Florida, which put us in St. Augustine the first night. The first night was Thanksgiving, so many shops were closed, but we came across what looked like a cute bakery on St. George St., and decided to stop there the next morning on our way to Miami. Some mornings, there is a line before the bakery opens. Inside you can order from the menu (eggs, etc), get a drink (tea, mocha), or get a baked good. I have to admit that once I saw the baked goods I didn't have any desire to look at the regular menu. 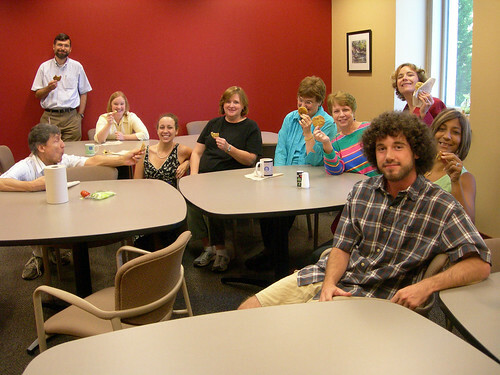 There were scones, croissants, danish, sticky buns, cinnamon buns, cookies, biscotti, and squares of various varieties. 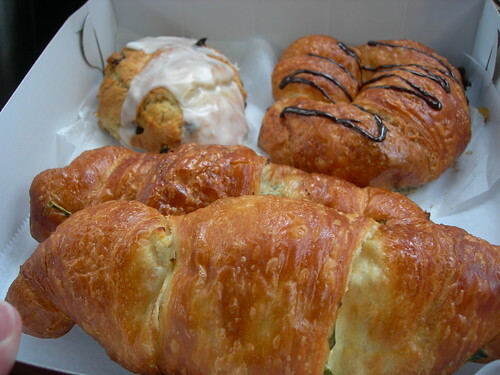 We got a few croissants and a Lady Sarah scone to try. 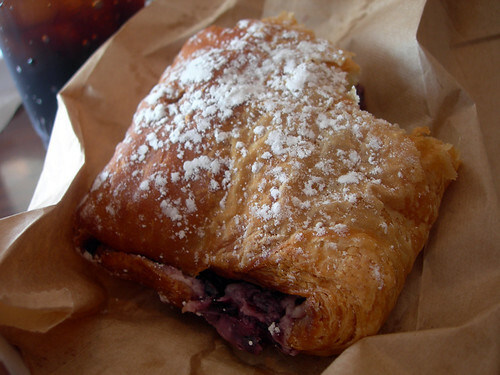 The croissants were among the best I've had - the perfect crunch as you bite into it, paired with the softness of the buttery layers inside. 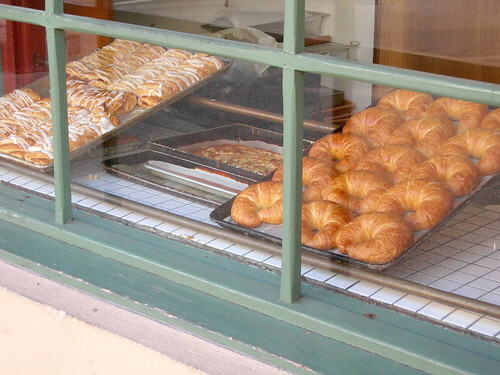 When we drove back home and stayed in St. Augustine again, you can bet we made a repeat trip to this bakery. I also purchased their cookie recipe cards that they make available and hope to try some of them soon. 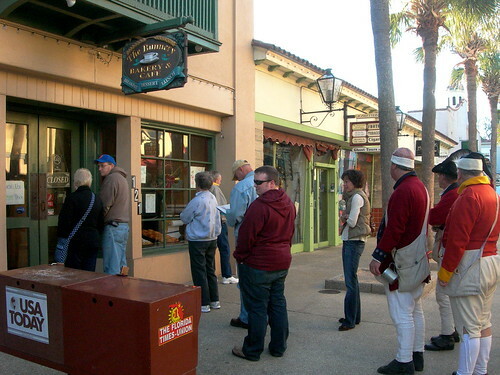 I loved St. Augustine and it seems to have some interesting places to eat. 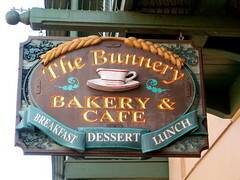 The next time I go there, I might be convinced to branch out, but it will be hard to resist coming back to The Bunnery. They are open daily from 8 am - 6 pm. I am actually in Miami getting ready to board a cruise ship for a week but did not want to miss posting when I had actually completed the challenge! I am typing from an iPhone though, which doesn't allow copying and pasting, so for now I am afraid I will have to omit links to the hosts and recipe. 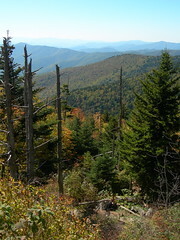 Upon my return I will remedy it all as well as more pics and my own experience. I will say that this recipe was sweet, incredibly sweet! I like to wait a few weeks before doing a challenge because I like to benefit from others experience. As a result I made sure the butter that goes into the icing was really browned, and I decreased the amount of sugar in the cake by 1/4 cup, just to try to cut back on the sweetness. I'm not sure it helped. These were sweet, sweet, sweet. 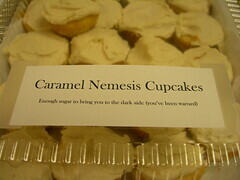 The point that I thought my nemesis had defeated me was when I added the caramel syrup to the cake batter. I had let it sit overnight to cool and it was too solid, so I heated it a few seconds in the microwave, putting it back to magma stage. At the point I added it, it made the batter seize up. As a result my cake was not purely caramel, more of a vanilla with caramel pieces. The recipe comes courtesy of Shuna Fish Lydon, as published on Bay Area Bites. 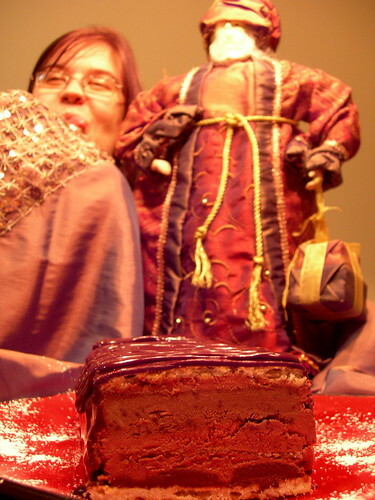 This Daring Bakers challenge was posted by Delores from Culinary Curiosity, assisted by Alex (Brownie of the Blondie and Brownie duo, and Jenny of Foray into Food. When I was in Miss McCoy's fourth grade class, part of our study of Oregon history included Native Americans. Since we were in the northwest, we had a potlatch that included food, and acted out myths that we had written ourselves (complete with homemade masks). 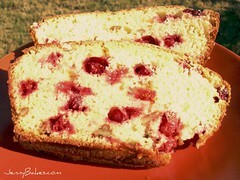 One of the recipes the class made was this cranberry-nut bread. My family made it for Thanksgiving that year, and it has been made every year this time of year ever since. That means I have been making this recipe for 21 years, if anyone was counting. The first picture is from last year, when I made it but didn't blog it. The rest of the pictures are from when I brought the muffin version to work, and were taken by Ed since I didn't have my camera. Thanks, Ed! Preheat oven to 350. In a bowl, mix together flour, sugar, baking powder, salt, and baking soda. Stir in orange juice, butter, and egg. Mix together. Stir in cranberries and nuts. Turn into a greased 9x5" bread pan. Bake for 55 minutes. Cool 10 minutes, then move from pan. (The muffins version bake for about 20 minutes). One thing I love about this recipe is how easy it is. Obviously, a classroom full of fourth graders managed, so give it a try. It makes a great hostess gift for Thanksgiving, or breakfast. I have had some days where baking just does not go well. (See potato bread day for a clear example!). The subject of this blog, however, is a recipe that appears to be cursed. Back when I worked at the Almost Home Tearoom making desserts, this pumpkin cheesecake was a seasonal favorite. I loved it for its lightness and interesting flavor combination - most pumpkin cheesecakes tend to be heavy and pretty solidly pumpkin in flavor. It is still those things, but something happens in its production each time I make it outside of the restaurant. The first time, as soon as it cooled i managed to get half of it to fall off the springform pan bottom onto the floor - that was a Thanksgiving where I was eating with friends, so I shrugged and brought the safe half with me. This year we were having a Halloween party at work, and I decided to bring the pumpkin cheesecake. I had everything mixed up when I realized I had no idea where my springform pan went. I don't think I've seen it since moving, but it was too late to want to go to the store. I decided to cook the cheesecake in a few ramekins and a 9" square pan, but that meant it didn't cook as evenly (you should have seen the cracks in the finished version) and the lovely maple sour cream layer never got added. 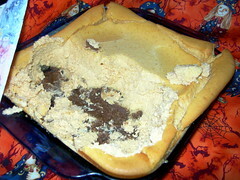 The funny thing about this cheesecake, it doesn't matter how bad it looks, people seem to like it anyway. 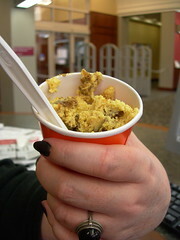 One co-worker was working at the reference desk, and rather than attempting to bring her a slice of cheesecake, she got a cup-o-cheesecake. This is a closeup of it, held by witchy hands (Halloween everyone), so you can see how very light in color it is. 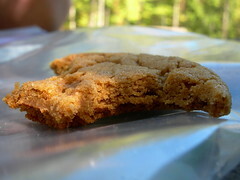 The crust is a delicious gingersnap concoction that goes very well with the pumpkin. I'm curious to know if it is just me who has this curse with this recipe, or if the recipe itself is cursed. If you try it, let me know what you find out! Press into bottom of 10-inch springform pan. Bake at 425 degrees for 10 minutes, and then remove from the oven. Pour into crust. Bake at 325 for 45 minutes. Turn off oven but do not open door for one hour. Spread over cheesecake. Bake at 425 degrees for 10 minutes. Cool one hour. Chill 3 hours and remove from pan. *We always used all gingersnaps, but at least half. **I have substituted pecans before for this, but almond is good. ***Don't leave this out - it really adds a very interesting flavor depth to this recipe. This month's Daring Bakers Challenge was the basic pizza dough recipe from The Bread Baker's Apprentice, hosted by Rosa's Yummy Yums where you can find the recipe if you are interested. The Bread Baker's Apprentice is written by one Peter Reinhart, who happened to open a pizza restaurant fairly recently in Charlotte, NC. Since Charlotte is two hours from me and on my way to a conference I attended earlier in the month, I was able to make a stop at Pie Town. Pie Town was a classy place, and was pretty busy during the lunch rush. Our waiter was excellent, and the menu had a lot of options even for us vegetarians. I ordered the Pie Town Margherita pizza (with local Chapel Hill creamery cheese), and N- ordered the wild mushroom. 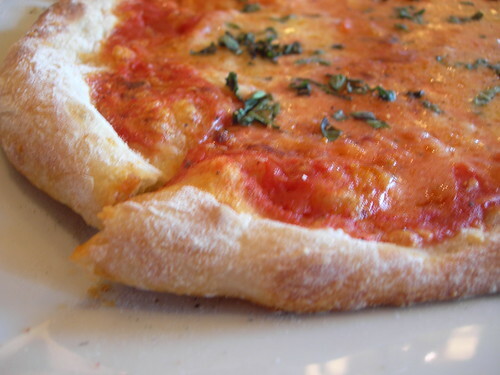 I loved the crust - it was chewy but not overly so. The middle of the pizza was a bit soggy but I loved that they served chili oil to drizzle over everything. I filed that little detail away for when I made the crust. While I was at Pie Town, I picked up an autographed copy of Reinhart's other book, American Pie: My Search for the Perfect Pizza. I flipped through it while plotting my own pizza recipes, and I really appreciated his advice for the home cook. So many pizza dough recipes I encounter assume you can or want to track down a tile or create your own pizza oven, and most of us just don't have the storage or resources! 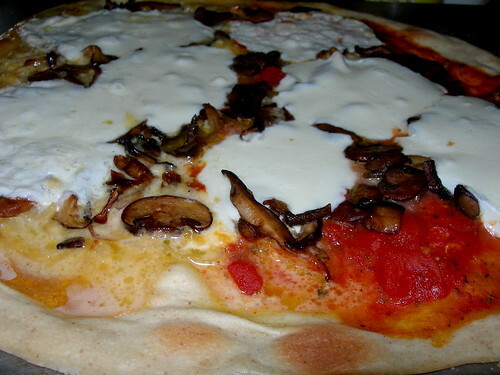 From American Pie, I made crushed tomato sauce, white sauce, sauteed mushrooms, and followed his general recipe for pizza margherita (pictured at top of this entry). I had purchased basil oil for drizzling on the top, but it is still sitting unopened, whoops. Next time. He also said you could substitute another flour for unbleached bread - 1 tbsp for every cup, so I did add about 1/4 cup of rye flour to the dough. I liked the additional texture and flavor depth that brought without altering the consistency. 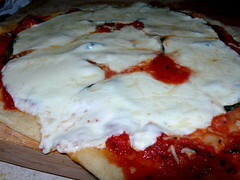 I had read about Pizza Bianca, or White Pie, throughout the book, and decided to make a version of it using this crust. The white sauce I made only covered half the pie, so that was an easy fix with additional crushed tomato sauce. On top of that went the sauteed mushrooms, and fresh mozzarella. 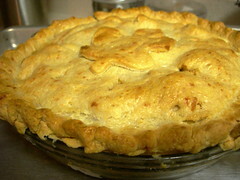 The white side of the pie was pretty sweet, since I cooked the onions in the white sauce so long. Sweet as in sweet-tasting, not sweet as in "dude!" The last pizza I made comes from Entertaining for a Veggie Planet. Sometimes I'll see recipes and they go into my mental storage to pull out at an appropriate time, and this butternut squash - goat cheese pizza recipe was the best possible combination of fall flavors and pizza! Also included were carmelized onions and fresh sage. 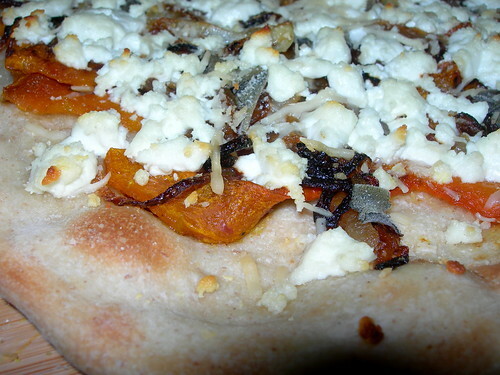 Delicious, and the goat cheese really balanced out the sweetness of the squash and onions. I think I liked this pizza the most out of the three because the other two had sauces or cheese that made the crust a little soggy. 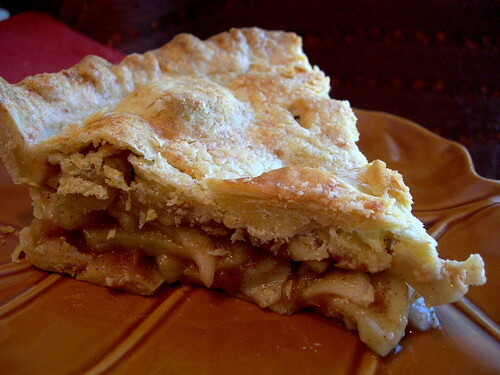 Growing up, attending many church potlucks*, I witnessed a strange repeating occurrence of older church members adding slices of cheddar cheese to their apple pie. At the time, I was disgusted but intrigued. I wondered if there was a way to fit the flavors together in an intentional way. I wasn't the only person to think of this. Sarah Moulton created a Double Crusted Cheddar Apple Pie, and John T. Edge pushed it even further in his Cheese-Straw Apple Pie, complete with cayenne pepper. I'm not sure why I picked Sarah's recipe, because she has said time and time again that she is not a baker. And from the reviews I knew the pie filling part was watery, so I substituted another person's pie filling for hers. I think the pie would have been better if I had picked a better variety of apples. It lacked depth of flavor to compete with the intensity of the crust. Oh, the crust. It was delicious. I'm not sure I'd pair it with apple pie again, and in fact, I used the remnants on a quiche tart (with "mom-dried" tomatoes, basil, and mozzarella), and it was marvelous in that capacity. But not just good flavor - flaky, buttery, and sturdy. Make the dough: In a food processor combine the flour and salt. Add the butter and shortening and pulse until it resembles very coarse meal. Add the Cheddar and pulse until it again resembles coarse meal. Transfer the mixture to a bowl. Add the yolk mixture, tossing with a fork until it forms a dough. Add more cold water 1 tablespoon at a time, if necessary. Form the dough into a ball, flatten it into a disc, and dust with flour. 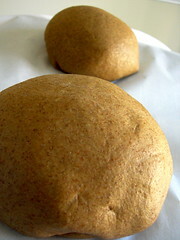 Wrap the dough in waxed paper and chill for at least 1 hour or overnight. * - in the south, these are sometimes called a "covered dish," in the midwest they were "pitch-ins." Just didn't want to confuse anyone! ** - I used cream. Why not. Yesterday was the first annual Colvin Family Oktoberfest. N- made vegetarian sausages, and I made Roggenbrot (German rye bread), Caraway-Ale Potato Salad, and Cheddar and Hard Cider Fondue (highly recommended). With all the dark, sour, and vinegary flavors included in German food (from beer to sauerkraut), it was essential that we have a sweet dessert to balance everything out. I think this must be why most German desserts are so sweet. CAKE: Beat eggs, sugar, and vanilla together until thick and fluffy, about 10 minutes. Alternately fold chocolate and flour into the egg mixture, ending with flour. Pour the batter into 3 8-inch cake pans that have been well greased and floured. Bake in a preheated 350 degree F. oven for 10 to 15 minutes or until a cake tester inserted in the center comes out clean. Cool cakes in pans for 5 minutes; turn out on racks to cool completely. SYRUP: Make syrup by mixing together sugar and water and boiling for 5 minutes. When syrup has cooled, stir in kirsch. Prick the cake layers and pour syrup over all 3 layers. 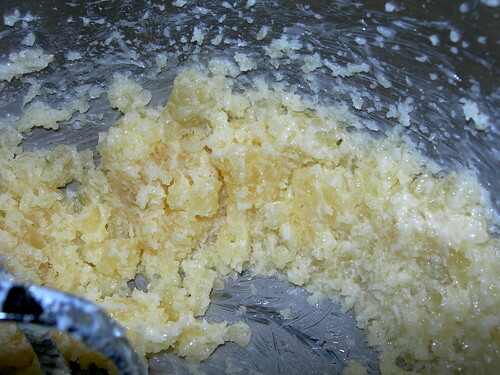 FILLING: To make the butter-cream filling, beat together sugar and butter until well blended. Add egg yolk; beat until light and fluffy, about 3 to 5 minutes. Fold in Kirsch. CAKE ASSEMBLY: To assemble cake, place 1 layer on a cake plate. Spread with butter cream filling. 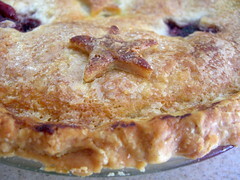 Using 3/4 cup of the cherries, which have been patted dry, drop cherries evenly over cream. Place second layer on cake. Repeat. Place third layer on top. Fold 2 tablespoons confectioners' sugar into the whipped cream. Cover the sides and top of the cake with whipped cream. 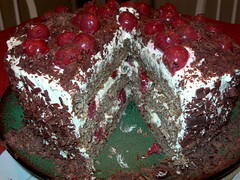 Decorate top of cake with remaining 1/2 cup cherries. To make chocolate curls from chocolate bar, shave (at room temperature) with a vegetable peeler. Refrigerate curls until ready to use. 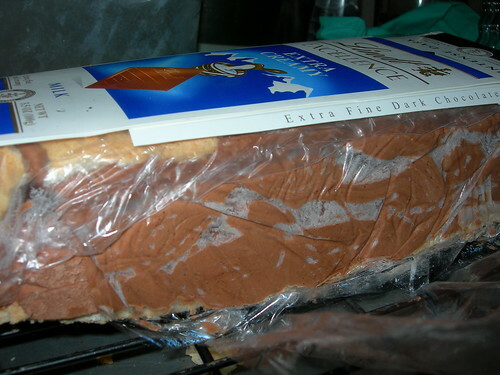 Press chocolate curls on sides of cake and sprinkle a few on the top. Chill until serving time. The only thing I didn't do very well was incorporating the chocolate - I think it was too warm, and I ended up with a flecked cake instead of a chocolate one. It still tasted good though. The kirsch is essential to make this "authentic" but it definitely has a presence. That combined with the sour cherries (as opposed to maraschino or cherry pie filling) makes the cake less sweet than you would assume, and there is a nice contrast and balance in the flavors. I wanted to be blogging about the rye bread which I spent a blissful 12 minutes kneading, but my kitchen was too cold, the dough never went through its second rise very well, and the end result was tasty but too dense. I really want to go more towards bread baking and get away from these super sweet desserts! Sometimes a cookie recipe is so good that you make it frequently. These big soft ginger cookies go so quickly, I always just try to make what I think we should eat and store the dough in the fridge. They almost disappeared on our picnic in the Great Smoky Mountain National Park before I thought to take a picture, which explains the strangeness of the photo. This recipe has been reviewed over one thousand times at allrecipes.com, and I'm glad someone pointed it my way. I wouldn't change a thing. 2. In a large bowl, cream together the margarine and 1 cup sugar until light and fluffy. Beat in the egg, then stir in the water and molasses. Gradually stir the sifted ingredients into the molasses mixture. Shape dough into walnut sized balls, and roll them in the remaining 2 tablespoons of sugar. Place the cookies 2 inches apart onto an ungreased cookie sheet, and flatten slightly. 3. Bake for 8 to 10 minutes in the preheated oven. Allow cookies to cool on baking sheet for 5 minutes before removing to a wire rack to cool completely. Store in an airtight container. The park is beautiful this time of year! There are a few baking blogs that I read with religious devotion, and Culinary Concoctions by Peabody happens to be one of them. She takes amazing pictures, develops creative recipes, and often tells funny stories. The entry that includes this recipe actually has a great story but I didn't notice it until I'd looked at it three times. 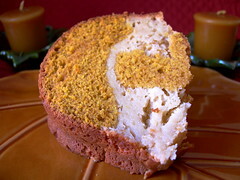 All I had eyes for were these amazing layers of pumpkin spice bread and maple cheesecake, all in one delicious mini loaf. When it came time to make the recipe, I didn't have loaf pans, so I pulled out my trusty bundt pan that I found for 50c at a garage sale in Broad Ripple, Indiana. It is an old fashioned metal one that you probably can't even buy anymore, but I adore it and make almost every breadlike or cakelike recipe in it. Someday I'll get out of my rut. You can tell there is more pumpkin spice on the "top" of the cake, meaning the "bottom" ended up being more like a marbled bread-and-cheesecake mixture, but frankly, I didn't care because it just tasted SO good. I also left the nuts out, like usual. The day the weather drops below 70 degrees or there is even a slight hint of a chill in the breeze, I have to start baking more. Autumn demands it! Just this weekend I made ginger cookies for a hiking trip, Souffled Pumpkin Oven Pancake for breakfast on Saturday, and this pumpkin spice bread. This one won the weekly blog post, hands down. You have to try it. 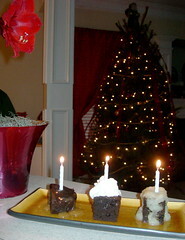 Go to her blog today for the recipe and other great creations. I stumbled across this recipe one day while looking for something completely different, and had tucked it away in my brain. As temperatures dropped, my fall baking instincts kicked in, but didn't seem to be interested in apples or pumpkin. I remembered this recipe, and there you have it. Jenny's Notes: There is a lot of sugar in these cookies, so they bake very flat. You can't see my nuts or raisins as well as in the Epicurious website recipe, because I used slivered almonds and golden raisins (that's what I had in the pantry!). I also added some cinnamon to the cream cheese to make it a little more flavorful. My biggest complaint with this recipe is that once you make the sandwiches, you really only have a dozen cookies. I have 8 hungry student workers, and wish I had doubled the batch. Because of the cream cheese I stored them in the fridge, and they reminded me of whoopie pies because of the chill factor. I'd definitely make these again. They were sweet, spicy, and chewy. I'd take these over carrot cake any day. I was pleased when I saw that this month's Daring Bakers challenge was something savory, and even more pleased when it was vegan! The idea was to make the lavash cracker recipe from The Bread Baker's Apprentice and make any vegan and gluten free dip to go with it. It was optional to make the crackers themselves gluten free, but since I had bread flour in my freezer needing to be used, I went with regular for that. Thanks to Natalie of Gluten A Go Go and Shel of Musings From The Fishbowl for picking a great challenge. (You can view the recipe at Shel's blog, or pick up a copy of this cookbook for yourself. I know it is on my wishlist! But back to the crackers. The posting date for this coincided with a international dinner night with friends, the theme of which was food from Saharan Africa. So I adapted the lavash and the dips that went with it to go along with this theme. I made the recipe for the first time last weekend, and didn't cut the crackers before baking. This meant breaking it into shards after it had cooled, and this worked okay, but I think they looked better the second time I made them, and precut them into squares or strips. The kneading also went better the second time, because I felt a specific moment when suddenly the dough felt like it was perfect, right around 8 minutes. You can see poppy seeds, kosher salt, and a greenish spice on the crackers in various combinations. 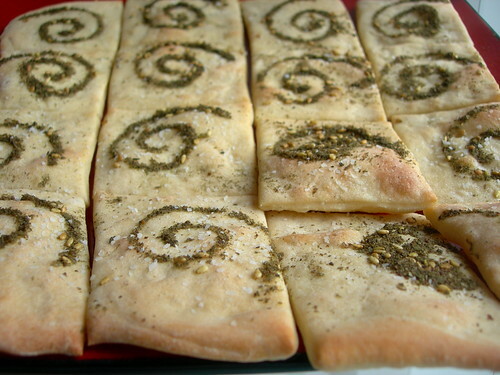 The green herb blend is za'atar, which is a mixture of thyme, sumac, sesame seeds, and salt. With its Arabic origins, I thought it was probably something that people in northern Africa would be familiar with, so it went along with my theme. Ever since visiting my friend Abbey in Chapel Hill, NC, and seeing her amazing cupboards of gastronomic wonder, I have been wanting to try to make something with pomegranate molasses. Last weekend when I sat down and went through my stack of magazines, I found a recipe for muhammara in the July/August issue of Vegetarian Times. It called for pomegranate syrup, but I pretended it said molasses and substituted accordingly. 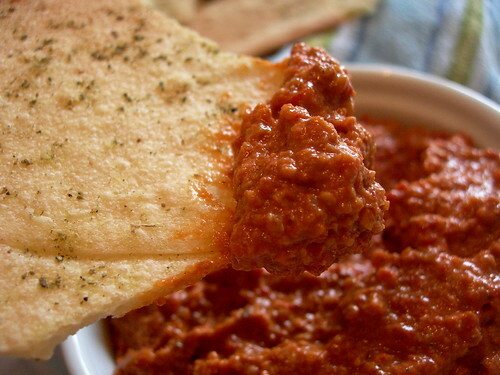 Muhammara is a dip made from roasted red peppers, olive oil, sauteed garlic, and toasted walnuts. It was tasty but I think next time I would use less of the pomegranate molasses and a little more garlic. 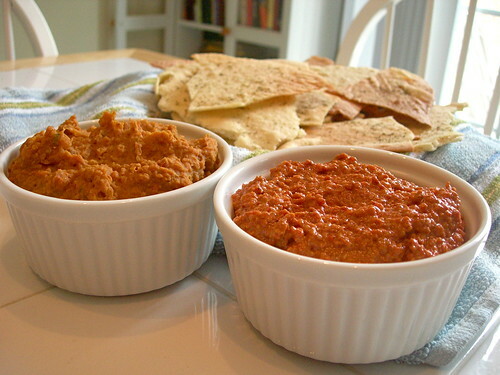 The other dip I made was Foul Mudammes, or Egyptian Fava Bean Dip. The hardest part about it, actually, was tracking down fava beans in town to make the second batch. I'm pretty sure Pita House is the only place selling them in a can, and I can always use an excuse to have to go there. 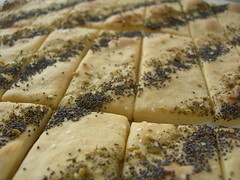 From what I've read, fava beans and a bread similar to lavash is a traditional Egyptian breakfast. If this is true, I will be relocating to Egypt and continuing to blog from there. It was delicious and a perfect balance of spices and tomato and beans. I think it will become a staple in our house, pureed and lumpy. This is the first time in a Daring Bakers challenge that I have felt that the recipe chosen would be something I would make repeatedly. I hope we see more savory challenges!! Since I'm a music librarian in my day job, I thought I would say that today I listened to Cheb Mami - Meli Meli as I baked the crackers, and as I blogged them. Too bad I didn't have any Umm Kulthum! I have wanted to have a home with a pantry in it for a long time, because I wanted to be like those tv cooks who walk the camera to their pantry and have all these magical ingredients inside from their travels and shopping trips. Since we bought our house, I have intentionally snagged uncommon food different places we go, and let it sit until I hit inspiration. A weekend trip to IKEA in Atlanta a few weeks ago meant that I brought home a jar of lingonberry preserves. Yesterday morning I woke up feeling productive, and one of the things I did was to sit down and finally go through a stack of magazines that I never seem to have time for. 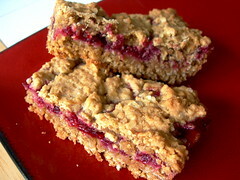 The picnic section of July/August 2008 Vegetarian Times had this recipe for Raspberry Oatmeal Bars that included the instruction to "Feel free to try this recipe with different jams," and my brain started going through what was in my pantry. I knew I had English ginger preserves, but wasn't sure they would come through the heaviness of the bar cookie. I thought I still had something left over from one of the NC farms we visited over the summer, but then I remembered the lingonberry. Now, I had no idea what lingonberries actually tasted like, but I suspected they were slightly tart, and I love cranberries with oatmeal, and decided to give it a go. It turns out that lingonberry preserves brought a lot of depth to this recipe. The slight tartness let the sweetness of the cookie have a flavor to play off of, and the way the berries still slightly explode in your mouth made for a fun eating experience. 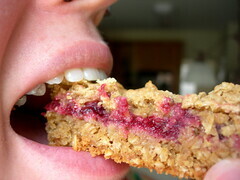 In fact, worried that I was boring people with my pictures just of food, here I am taking a bite of one. They certainly didn't last long in my house. 1. Preheat oven to 350°F. Coat 9-inch-square baking dish with cooking spray. 2. Sift together flour, cinnamon, baking soda, and salt in large bowl. 3. Cream sugar and butter until light and fluffy. Beat in egg and vanilla and almond extracts until smooth. Add flour mixture to butter mixture; mix until combined. Stir in 13/4 cups oats. Spread 2/3 of batter on bottom of prepared baking dish. Spread raspberry jam over the batter with back of spoon. 4. Add remaining 1/4 cup oats to remaining batter. Crumble over top of raspberry jam. Bake 30 minutes, or until golden. Cool, then cut into bars. *And of course, substitute any jam or preserves here! I used less than a cup. I will admit to plying my students with goodies, especially on days like today when I needed them to come in for a meeting on a weekend. 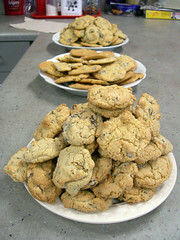 I made two kinds of cookies for today - Fiesta del Sol Cookies and Kitchen Sink Cookies. 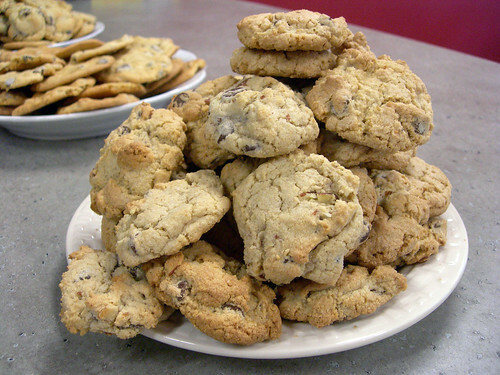 Kitchen Sink Cookies are just what they sound like - today they had chocolate chips, butterscotch chips, oats, and coconut, but they could have had nuts, dried fruit, cereal, anything needing used up. The second cookie is more of a unique flavor combination - cornmeal, lemon, and cinnamon - with the look and feel of a snickerdoodle. The cornmeal makes it a little crunchier. I love this cookie. I found it a few years back in the Enduring Harvests cookbook, which I highly recommend if you are looking for native americanish dishes or some new flavor combinations. Cream together sugar and butter, then beat in the egg and vanilla. Mix in remaining ingredients. Blend together well. Cover and chill 2-3 hours or until firm. Preheat oven to 350 F. Shape cookie dough into small balls, about 1/2" in diameter, and roll in the cinnamon-lemon sugar. Set cookie balls 1" apart on lightly greased baking sheet. Bake 10 minutes or until just honey golden. Jenny's notes: I might recommend doubling this recipe, but because each cookie is pretty small, it makes more than you might think. Any time a recipe includes zest of a citrus, I like to mix it with the sugar in the recipe before creaming it with the butter. I think it makes the cookie more fragrant. I have great student workers! Happy 2008! If you are a Daring Baker, chances are you came by to check on my chocolate eclairs. As usual I procrastinated but then today ended up with bad baking mojo! I have learned from experience that when one recipe fails, I may as well hang up my apron for the day. I may attempt the eclairs tomorrow if I end up with time on my hands. I do have the day off, and all the ingredients, so we'll see. 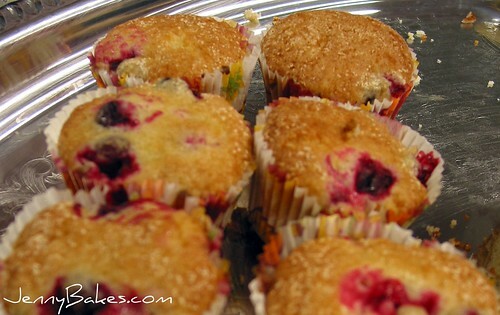 These plum cakes are a gem from the Baking with Julia tv series and accompanying cookbook. I have been recording all the old episodes on PBS to try to learn something, and this recipe seemed so simple and summery - finally, a fruit dessert that doesn't cover up the taste and freshness of the fruit! I even bought ramekins for this dish, since I didn't have enough. Well, I think I just tried taking too many shortcuts. I didn't have buttermilk, so I added vinegar to the milk, and probably didn't wait long enough. I mixed everything by hand so I'm not convinced the butter and sugars creamed enough. I divided the recipe by half. It isn't ... bad, exactly. The batter just isn't holding the plum as much as it should. The creme chantilly that I made is good though. And you can definitely taste the plums, maybe too much. On the day of the great wine berry quest, all I came home with were blackberries. So I made a pie. And it was beautiful. That's all you're getting out of me for tonight, I'm afraid. What dessert means summer for you? I spent last week at the beach in North Carolina. Bakeries in tourist towns have always interested me, because I have wonder if it is really possible to survive as a business with seasonal customers. Just Baked Bakery Cafe proves it is possible. Two years ago, Just Baked was just a small little bakery, and it has now expanded into a larger space, also serving lunch and dinner. It is to my chagrin that I only decided to go here on my way out of town, since their lunch menu looked amazing and the smells that were coming from the kitchen would have brought me back daily. 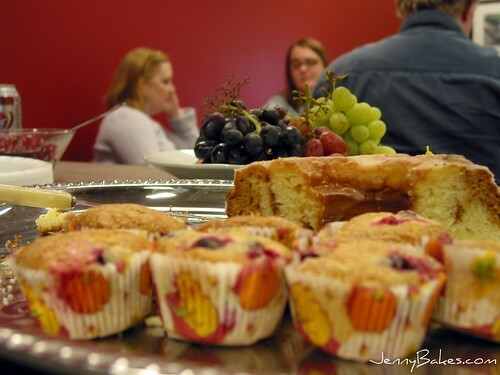 Since I was there during breakfast, most of the offerings were pastries, muffins, and scones. They had already put out cookies, pies, and breads for the day, and I could see cupcakes and cakes cooling in the back. 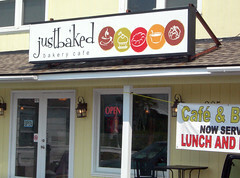 You can look at the Just Baked Bakery Cafe website to see pictures of their cakes and other menu items. One night for dinner we had some bread that was like a cross between Italian and foccacia, and was delicious - nice air pockets, chewy, and flavorful. Originally, I thought I'd just want to return to Topsail Island for the beauty of the ocean. Now I have two reasons to return! To anyone looking here for the Daring Bakers challenge, I skipped this month! But I had a sack (known as bag in these parts) of fresh local peaches that I needed to do something with. 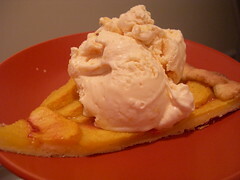 I decided I had to make fresh peach ice cream, and made a lovely rustic honey peach tart to serve underneath. Ha, I say that like the ice cream was the main attraction. Actually, the peaches are. It is always a challenge to find recipes that utilize fresh fruit without masking its freshness and flavor completely. The nice thing about the tart is that the crust is rolled thin and only is folded up around the edge, allowing the peaches to be the focus of the flavor. Since they are in one layer, they don't need to be mixed with much, and are in fact layered on top of a sprinkling of flour and sugar and drizzled with honey. The recipe is here but the baking time is 10 minutes too long, so really keep an eye on your crust. 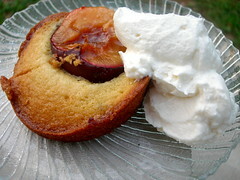 The peach ice cream recipe comes again from The Perfect Scoop, and was interesting because it contained sour cream. The flavor was superb and a great show case for these South Carolina peaches. For a closing word on South Carolina peaches, I turn to Stephen Colbert. Today is my 2nd blogiversary! To celebrate I originally intended to do something elaborate and involved, but then I came across Cream Puffs in Venice's entry on the chocolate chip cookie heard round the world, and hit inspiration. 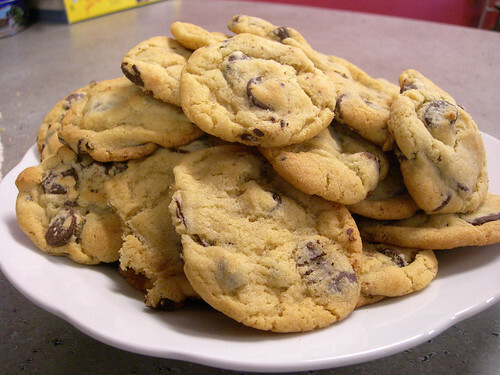 You know, there are a lot of chocolate chip cookie recipes out there, since it is such a classic. A lot of them claim to be the best. So I figured, why not put them to the test! 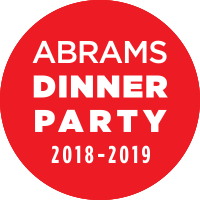 Before we get to the challenge, please get to know our judges, some of the staff and faculty of the library at Furman University, where I am privileged to be the music librarian. I brought the three recipes of chocolate chip cookies to break today and encouraged feedback. I think most people had at least three cookies, so they were prepared to give a score! Let's start with what I've named the Urban Legend Cookies. I'm sure you've heard the story, or something similar, where someone ate at the Neiman Marcus cafe, liked a cookie, asked for the recipe, and was charged $250 for it. To get back, they have made this recipe freely available to you, and please forward it to all of your friends. I first made this recipe years ago, back when I actually read forwards in my e-mail, and laughed when my Mom sent it to me the other day like it was something new. You can check out Snopes.com if you want to know if the story has any truth, but true or not, this story at least has longevity. I included it merely for its story, knowing I didn't care much for the cookie itself. 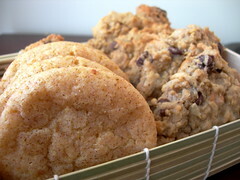 Ground up oats is a terrific idea, but there are simply too many dry ingredients in this cookie for my taste. Neiman Marcus offers a recipe on their web site to counter the urban legend, but this is not the one I made (although it actually sounds pretty good). Instead I made the one that has been forwarded to me, and now you can too, if you want. My mixer wouldn't even hold the entire thing, and I would recommend halving it. 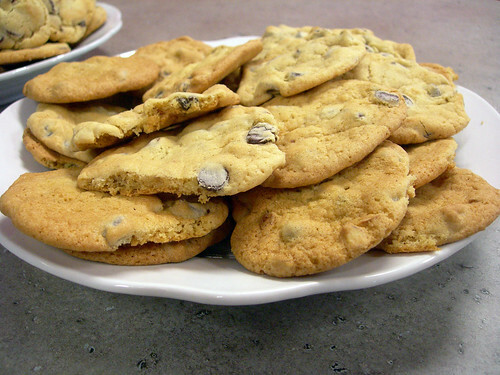 The second recipe vying for gold was the original Tollhouse Chocolate Chip Cookie recipe, what most people think of as chocolate chip cookies. That is the most frequent comment made from the "judges," that this recipe was what they remembered from childhood. The texture was also remarked on. I have to admit, I cheat on this recipe a bit - instead of using 1 cup butter, I used half butter and half margarine because they stay softer longer. Other than that, this is THE original recipe, and is what I would recommend if you just want something classic. A few more than half of the judges picked the Jacques Torres chocolate chip cookie as being their favorite. This is the recipe Cream Puff posted about as well, and I don't understand the science any more than she did, but the strangest step is leaving the dough in the fridge for 24 hours. It did have much more depth of flavor than the other two, and seemed to hint or beg of orange, despite a lack of citrus. For some of the judges, it was far too salty, and did indeed have 3 times as much salt as the other two recipes. For the cookie olympics of 2008, the Jacques Torres recipe gets the gold by a millisecond. The traditional Tollhouse recipe wins the silver, and the urban legend Neiman Marcus arrives at a distant third, but picks up the bronze medal. 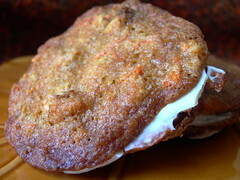 For a funnier take on chocolate chip cookies, please visit my good friends at Cakespy. Okay, I've never met them, but they're the kind of people you want to claim to know.